Emerald Waterways’ new ship Emerald Radiance offers passengers four types of cabins. 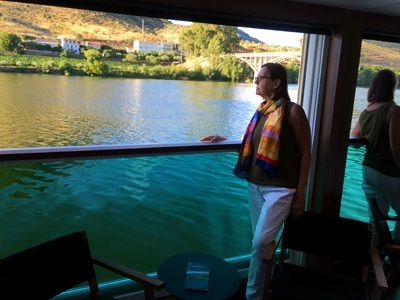 Top of the line are two Riverview Suites wrapping around the stern on the upper deck with gorgeous views of Portugal’s Douro River on two sides, a spacious sitting area and oversized bathroom with shower and tub. Two slightly less heavenly Owner’s Suites sit next door. At the other end of the price spectrum, Staterooms on the lowest deck have a window and standard bath. Bill and I share a cabin in the most common category, the Panorama Balcony Suite with an uncommon window/balcony configuration. 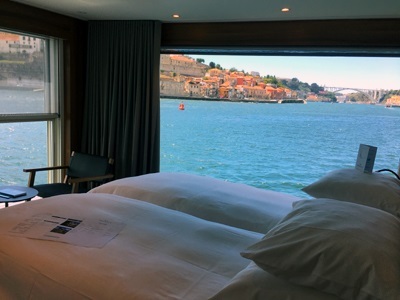 Rather than a traditional balcony jutting out from the side of the ship, these suites have floor-to-ceiling windows. With the push of a button, the top half lowers to about waist height allowing us to lean out to take in the view. With a table and two chairs nearby, it’s like having a balcony inside your cabin. We sat there with morning coffee and evening adult beverages enjoying the fresh air. A screen can be lowered to keep the bugs out. Our suite’s closet was roomy enough for us and two walking sticks standing in the corner came in handy on today’s excursion to Lamego. 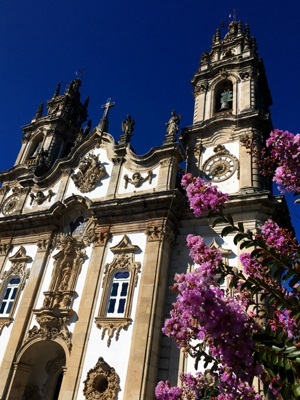 The main attraction in Lamego, the Sanctuary of Our Lady of Remedies, stands atop a hill overlooking the city’s red-tile rooftops. The Emerald motorcoach dropped us at the top for a look at the church, a mix of baroque and rococo motifs, with a stunning façade and unusual statues depicting Mary breastfeeding baby Jesus. Emerald guides warned us the walk down to town would mean taking 686 granite steps, but encouraged us to try rather than take the coach. I grabbed the walking stick and decided to go for it. The stairs are broken up by nine terraces where statues depict the Stations of the Cross and blue and white tiles, azulejos, form murals of religious scenes. Changing views of the city below and sanctuary above caused us to stop several times to take photos. Before I knew it, we reached ground level, my gimpy knee no worse for the wear. Our guide told us some of the faithful mark religious holidays by climbing up the stairs on their knees, the spiritual ascent becoming a pilgrimage. In comparison to this heavenward trip, several fellow passengers complained last night’s excursion in Pinhao sent them in the opposite direction. 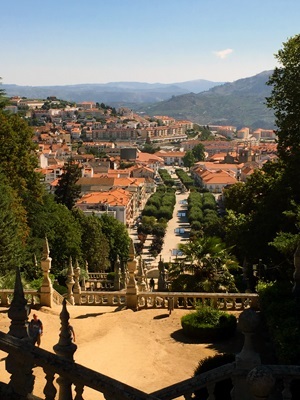 Emerald tour escorts led a walk through the tiny village to the former railway station where ceramic tiles depict bucolic scenes of the Douro River Valley wine country. Our large group overwhelmed the narrow and sometimes non-existing cobblestone sidewalks spilling us into streets of hellish traffic where aggressive drivers had little patience for our meandering. Back on board the ship, I heard passengers scoff that this was not a well-managed tour. One couple said they left our group halfway through and struck out on their own. In hindsight, I wish we had done the same. Emerald Waterways includes one excursion in each port in the cruise price and offers a few Discover More excursions for additional cost. To make it easier for passengers to hear guides, all cabins contain two Quietvox personal audio devices that broadcast a tour guide’s commentary into an earpiece. Unfortunately, they can’t do anything about bad drivers.